After a week of sunshine and hot temperatures it looked hopeful that Friday night’s thunderstorm might have cooled things down somewhat for the weekend’s races, but this was not the reality unfortunately and conditions stayed warm for running. On Saturday three Okehampton Running Club members travelled down to South Devon to take part in pureTrail’s Race the Tide. Set in the beautiful Flete Estate there were three distance options, a 10k, a 16mile ‘long half marathon’ and a 29mile ‘long marathon’. All three Okehampton runners chose the middle distance race, which takes runners on lovely woodland trails for the first 6miles before they cross the Erme Estuary to join the SWCP. This is where they have to beat the incoming tide as the start time is set so they only have 96 minutes to reach the crossing point. From there they follow the coast path with its typical steep ascents before heading inland on bridlepaths back into the woodland of the Flete Estate. With a total ascent of 629 metres, muddy tracks, river crossings and narrow coastal paths this was a tough test of fitness for ORCs Jo Turner, Katie Speak and Carole Cornwall who all enjoyed the scenic route despite its hard nature. Jo did well to finish in 3hr.3min.16sec to come second in her age category. Katie and Carole ran together as they often do, finishing in 3.30.59. Dorset was the destination for Okehampton’s Caroline Wilson and Nicola Smith to run the Dorchester Marathon. This is the first year of this event organised by White Star Running and the Dorchester Rotary Club. Nicola’s first marathon had been an off road one in this county last year, but this was very different being entirely on roads through the lovely Dorset countryside. The hot sunny day didn’t make for good running conditions, especially on a tough and hilly course so hopes of their target times were shelved and they were happy to complete in 5.08.05 which was still a 10min PB for Nicola. Back in Devon there was another completely new marathon on Sunday, the Women Can Marathon.This women only race was inspired by Katherine Switzer who was the first woman to officially complete a marathon 50 years ago at the all male Boston Marathon. She did this despite being manhandled by officials who tried to drag her off the course two miles in, and thereby changing women’s endurance running forever, proving that women weren’t too fragile to run such distances. The women running this new Women Can marathon certainly had to be tough as this was a largely off road race with nearly 2,000ft of ascent, in the beautiful countryside around Sidmouth and Ottery St Mary, including a section of the coast path between Budleigh Salterton and Sidmouuth. For ORC Deborah Cunningham this was her 8th marathon, but she found it her toughest to date. Hannah Ramsey however, had never run a marathon before and so this was a very tough introduction to marathon running. She was very happy to complete as she had a painful knee most of the way and really suffered in the last four miles. No times available yet. On Saturday the ‘ORCs on Tour’ bus took four runners to the Exeter Riverside parkrun. Having set a 5k PB at the Tamar Lakes parkrun the week before, Jackie Dawes managed to improve again to clock a new PB of 24.15. Geoff Hill was 7th overall and the first Vet male home, setting a new PB of 18.22. The Okehampton Running Club Awards Evening will be held on Friday 9th June at Okehampton Golf Club. Starting at 7:30pm the meal is a buffet style and you can pay at the bar at the end of the evening. If you would like to attend please contact Cathy Carey as soon as possible so we know the numbers. You can find the voting slip below. Please ensure this is returned by 2nd June! Jane has put together a great report on the achievements of ORC members over last 12 months (1st April 2016-31st March 2017) which we hope will assist. You can find this below. Sunday saw ORCs competing in three different races ranging in distance from 10k to 100miles! 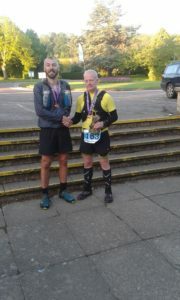 Rob Hicks, who ran the Westcountry Ultra 100, in fact started his race on Saturday, but completed on Sunday morning, just one of four runners to finish in under 24 hours, coming second in 22.53.11. This incredible race combines the routes of two fifty mile ultras, the first one a relatively flat course starting in Taunton and following the Bridgewater canal towpath all the way to Bridgewater docks, and from there coastal paths, trails and through villages to Minehead. The flat nature of this first section makes it hard for the runners to pace themselves to conserve energy for the second fifty which is considerably tougher. The second half sets off at the beginning of the South West coast path, which it follows all the way to Lynmouth, then up the river Lyn and onto Exmoor along the Coleridge Way, before crossing County Gate and dropping to sea level before one last big climb up Dunkery Beacon and home to Minehead. Despite the flattish first half the total elevation for the race is nearly 9,700ft of ascent. Only three weeks previously Rob had taken part in another hugely challenging event, The Great Lakeland 3 Days. This is not a race but an organised mountain marathon in the Lake District, where runners have to self-navigate and be self-sufficient throughout each of the three day’s runs although their kit and overnight equipment is transported between each overnight camp. There are three levels of difficulty and Rob ran the top level, the Elite, running 26 miles the first day, 20 the second and 17 on the last day, by which time he had climbed over 26,000 ft of ascent, more than climbing Everest! In Exeter three ORCs took part in the Exeter Marathon. This is a three lap race starting in St James Park and heading through the city centre to Exwick before returning along the Quay to Countess Weir with most of the route on the paths and cycleways beside the canal and River Exe. On such a flat and open course the blustery wind was a bit troublesome but all three runners ran well, with first ORC home being Roger Voaden, finishing in 3.11.00. Chris Turner, who continues to improve, was next home in 3.27.11 to set a new PB by one minute. Mark Hawkins had entered on impulse having not had a good run at the Madrid Marathon a few weeks ago due to the heat, and found the conditions here much more to his liking, finishing in 3.44.18 to knock a huge seven minutes off his current PB. Just two ORCs ran the Burrator 10k on Sunday. This is a relatively flat course, set in beautiful scenery, is all on tarmac around Burrator Reservoir where the runners do one full circuit and then two thirds of it again, finishing at the Visitor Centre. George Haskell paid the price of setting off too fast in his race, slowing in the second half, to finish in 42.37. Kerry Morashti enjoyed her run in the lovely setting, finishing in 67 minutes. Geoff Hill, has organised a new outing for members once a fortnight, an “ORCs on tour” trip to local parkruns, taking up to eight runners in his minibus. The first outing was on Saturday to the Tamar Lakes parkrun, and the opportunity inspired several members to try one of these events for the first time. This is not perhaps the fastest course, being slightly undulating, with runners doing one 5k lap following the tarmac and cinder paths around the Upper Tamar Lake. Ray Lawrence was the first ORC home in 19.26 to come second overall, 1st Vet Male and scoring the highest age graded percentage of the day on his 50th parkrun. Mike Baker was next in 20.54 on his debut run to come 3rd Male Vet, followed by another new parkrunner, Ed Dumpleton in 21.09. Sarah Marvin was the overall first lady home on her inaugural run in 22.06 with John Binns, for whom this is his local parkrun, not far behind in 22.19. Jackie Dawes, another first timer, was paced by local ORC Anne Binns, to set a new 5k PB with both of them finishing in 24.59 and both of them winning their age categories. Jane Richardson is definitely not new to these runs, having completed her 100th parkrun in Exeter two weeks earlier and finished in 29.39 to score the second highest age grade percentage and win her age group. Janet White was second in the same category in 32.46 on her first outing to a parkrun. Geoff Hill took this opportunity to run with his 11year old daughter Shelby who knocked over 5 minutes off her PB in only her second parkrun, to come first in her age group. A beautiful sunny spring morning greeted the runners for the Bideford 10k on Sunday and, with only a slight headwind on the return along the Tarka trail, the running conditions were pretty good. There was record turnout of 1,100 runners there and we had seventeen members representing ORC. Always regarded as a fast course, the runners follow the slightly undulating road out to Instow before returning to Bideford on the Tarka Trail. This year, for the first time, the runners’ finishing straight was along the Quay walkway instead of the pavement, which meant not having to dodge pedestrians, bollards and a bus stop! First ORC home in a great time of 41.18 was Mark Hawkins, his first race since the Madrid marathon 3 weeks ago and a PB by over 3 minutes. Not long after came ORC’s first lady, Katie Littlejohns with another PB of 42.43, just bettering her run here last year and taking the 3rd Senior Female prize. There were seven other Personal Best performances by Sarah Marvin; 44.23, Jo Bradford; 53.30, Ruth Bushell; 58.59, Rachel Holland; 59.47, Jo Burrow; 1.01.48, Jessica Corcoran; 1.02.16 and Claire Sprague; 1.04.06. This was Ed Dumpleton’s first 10k race having run only a half marathon and a 10miler before and he set an excellent time of 44.16. One of last September’s beginners, Elizabeth Baker, was running her first race of any sort. Her running has come on really well with the help of some training with her husband Mike and she completed in 1.04.07. Other ORC times; Mike Baker; 43.27, Andrew Thorne; 44.05, Jackie Dawes; 50.21, Rachael Haydon; 58.30, Trace Mills; 59.46, Jane Richardson. The Okehampton Male Vets Team (Mark, Mike, Andrew and Ed) were placed second and the Senior Female Team (Katie, Sarah and Jackie) were also second. While most of the club were running a short distance this week, prolific marathon runner Roger Voaden took a trip down to run the Imerys Trail Marathon. This is a tough multi terrain race covering farmland, sand roads and tracks, and, if you have the energy to appreciate it, some lovely scenery. The newly introduced cut-off times in the race didn’t trouble Roger, who is no stranger to this course and celebrated the running of his 60th marathon by finishing in an excellent time of 3.28.30, to come 6th overall. Geoff Hill made the journey to south Wales last weekend to run the Great Welsh Marathon. Since running his first marathon last September in Loch Ness, Geoff has been plagued by injuries and only got back to training 8 weeks ago, so he was a bit short of miles under his belt and went into this marathon just glad to have made it there. Starting and finishing in Llanelli Festival Fields, the fast and flat route along the Millennium Coast Path is a scenic double out and back looking out to the Gower Peninsula. Despite his lack of preparation he ran a brilliant race to finish in 3.23.43 to come 19th overall and set a new PB by over 20 minutes. On Saturday evening Katie Littlejohns took part in the Ivybrige 10k. This scenic race is over a fast course with just one steep hill, but the last 6k is all downhill making for a very quick second half. Katie ran well to finish in 43.18. Christine Fritsch set herself another huge challenge on Sunday, becoming the second member in the club to run the Dartmoor 600’s. This is not a race, but a run between the five Dartmoor hills over 600 metres. The five summits are Yes Tor, High Wilhays, Cut Hill, Hangingstone Hill and Whitehorse Hill. It is unmarked and unmarshalled and those who run it choose their own route and must be competent to navigate over open moorland. Okehampton’s Fell running specialist Rob Hicks completed this challenge a few weeks ago and on Sunday Christine’s route took her 4.45.16 to complete nearly nineteen miles of rough terrain with 2,900ft of elevation. Another busy weekend of races saw ORC members at various events across the country. Hugh Robinson travelled to Milton Keynes to take part in the marathon there which this year formed part of the celebrations for the town’s 50th birthday. Hugh was running his first marathon in over three years and had been targeting a run under three hours, despite his training being interrupted by illness. Runners set off in almost perfect running conditions – cool spring sunshine with little wind. The first few miles take in the wide boulevards and crowd support of the town centre, before cycle paths and footways lead the runners into more rural villages, past lakes, the Milton Keynes Peace Pagoda, roman ruins and the famous concrete cows before a stadium finish at the impressive home of the Milton Keynes Dons. He ran a good consistent pace for his target up to mile 20 when his energy levels and speed dropped. Still keen to get a Good for Age qualifying time for London next year he made it back to the stadium and sprinted the perimeter of the pitch at the finish to secure a time of 3 hours 5 minutes exactly – securing the qualifying time of 3:05 without a single second to spare and setting a new PB by over 2 minutes. The North Dorset Village Marathon has grown a reputation for being a well organised, friendly race which takes runners through pretty villages where there is plenty of support and beautiful quiet countryside. It couldn’t be more different from the London Marathon the previous week and that is perhaps part of the attraction of it. A sprinkle of ORCs have attended this race over the years and this year there were two running it. Roger Voaden ran a brilliant race in London but he still enjoyed his second run here, finishing just a minute slower than in London in 3.08.14, for 7th place overall. Lucy Marrison had entered having been a training buddy to Heidi Wills who had run the London marathon and, not wishing to waste all the hard work she had put in, decided to run here. She found it a bit lonely in places, but with Heidi’s support at different locations she was happy with her finishing time of 4.28.35 and with her very unique medal. In North Devon a very different sort of race saw three ORCs take on the challenging 18 mile Hartland Hartbreaker and three more tackle the 9 mile route. This notoriously tough race starts at Hartland Abbey and the runners are treated to a course that takes them through bluebell woods, stretches along the rugged coast path, through fields and back to the Abbey where the shorter course finishes. The long route heads back to the coast again, this time heading south where the cliff top paths are only inches from vertical drops. The heavy rain the day before made for terrible conditions underfoot with slippery mud and wet rock. The pain of the run was eased however in places by cocktail, prosseco and beer stops! Karen and Lucy Skye love this race and finished in 3.43.13, happy despite several falls, (due to the conditions, not the drink!) Christine struggled, having completed some really tough races recently and an exclusion diet lowering her energy levels, but enjoyed it enough to want to return, having finished in 4.31.38. In the shorter race Katy Speak and Carole Cornwall ran together coming home in 2.00.04 with Kerry Morashti finishing in 2.17.45. There was a great turnout of ORCs at a completely new race later on Sunday, The Pennywell Pursuit 10k. Starting and finishing at Pennywell Farm, this is a challenging 10k charity run through the lovely South Hams countryside in aid of the Torbay Holiday Helpers Network. Unfortunately the beautiful scenery couldn’t be appreciated when the heavens opened soon after the start, the rain making for difficult conditions with the mud and hills and the runners found the going tough. For three of the runners, Katie Bolt, Susan Read and Philip Read this was their first ever race, and Jackie Dawes’ first venture into trail running, but all completed the course successfully. ORC times; Jackie Dawes; 1.07.27, Ruth Bushell; 1.15.04, Danielle Fullford-Brown 1.16.46, Rachel Haydon; 1.20.14, Janet White; 1.20.16, Katie Bolt; 1.23.05, Jessica Corcoran; 1.23.44, Claire Sprague; 1.26.03, Sarah Bell; 1.30.07, Dani Bryant; 1.32.12, Susan Read; 1.45.23, Philip Read; 1.45.25. Error: Error validating access token: Session has expired on Saturday, 20-Apr-19 03:20:42 PDT. The current time is Monday, 22-Apr-19 10:55:48 PDT.